Its nearest relatives are Kunwinjku / Kune / Mayali (varieties often grouped together as Bininj Kunwok) and Rembarrnga, and other languages in this family include Jawoyn, Ngalakgan, Ngandi, Wubuy, Kunbarlang and Enindhilyakwa. The traditional territory of Dalabon-speaking clans centred on and to the west of the upper reaches of the Wilton River, along the eastern and southern edges of the Arnhem Land escarpment. Although many Dalabon people still live on their country today, in communities such as Kolobidahdah, Yayminji, Weemol, Korbbolyu and Bulman, others live in communities on the territory of adjoining language groups, such as Barunga, Beswick (Wugularr), Manyallaluk (Eva Valley), Kunbarllanjnja (Oenpelli), Jabiru and Maningrida. Many fluent Dalabon speakers spend or have spent periods of time in and around Katherine, where Mayali has tended to be the most-widely known and spoken Aboriginal language. The dispersion of Dalabon speakers has reduced the opportunity for younger members of the community to hear and participate in regular conversations in their ancestral language. Although many younger people speak some Dalabon, and are interested in learning more, it is giving way, as the main vehicle of everyday communication, to Kriol and English in the south, and Kunwinjku / Kuney and English in the north. We hope that by putting up these Dalabon stories online, recorded from a number of different Dalabon speakers in different locations, we will assist young Dalabon speakers and others who are interested in hearing their ancestral language, wherever they live. Permission to put these recordings online has in each case been obtained from the person or people who we have been told holds the most authority to authorise them to be put online and in most cases the elders we asked, and their families, were enthusiastic about the chance this gives to pass on their knowledge and voices. Anyone who has concerns about any recording posted here should contact us at Wolfgang.Barth@anu.edu.au so we can renegotiate the conditions or limit access. Dalabon is also known as Dangbon, Ngalkbon or Buwan. The term Dangbon tends to be used by speakers of Kune or Mayali, Ngalkbon by speakers of Jawoyn, and Buwan by speakers of Rembarrnga. But the terms are also used by Dalabon speakers themselves on the basis of which other language group they most regularly have dealings with. There are a few differences between ‘Top End’ or northern Dalabon and ‘bottom end’ or southern Dalabon, which will sometimes be characterised in terms of the difference between Dangbon and Ngalkbon. There are also said to be differences depending on the moiety affiliation of clans speaking the same language, with Duwa clans speaking Dalabon-djurrkdjurrk (‘quick way Dalabon’), and Yirridjdja clans speaking Dalabon-muduk (‘slow way Dalabon’), but no different words correlating with this difference have yet been found, so it more likely reflects an overall prosodic style of speaking, rather than the more formalized differences found in the Yolngu languages to the east. Each of the four language names can be broken down into the word bon ‘go’ plus, in three cases, the word for ‘mouth’ in the language using the name: in other words, “people in whose mouth (language) one says bon for ‘go’”. In Dalabon, dalû- means ‘mouth’ (occasionally you hear the name pronounced Dalûbon as an alternative to Dalabon). Dangbon and Ngalkbon are parallel formations based on the root for ‘mouth’ in Mayali or Kuney (which is kun-dang or dang-no) and Jawoyn, where the word for ‘mouth’ is ngan-ngalk (kun- and ngan- are noun class prefixes). Buwan, used on the Rembarrnga side, is the Rembarrnga pronunciation of bon: lots of words in Rembarrnga have changed o to uwa: kom, which is the root for ‘neck’ in Dalabon and Mayali, is kuwam in Rembarrnga. Bordulk, D., Dalak, N., Tukumba, M., Bennett, L., Bordro Tingey, R., Katherine, M., Cutfield, S., Pamkal, M., & Wightman, G. (2012). Dalabon plants and animals: Aboriginal biocultural knowledge from southern Arnhem Land, north Australia. Palmerston, NT, Australia: Department of Land and Resource Management, Northern Territory Government. Evans, Nicholas (2007). Standing up your mind: Remembering in Dalabon. In Amberber, Menghistu. The Language of memory in a Crosslinguistic Perspective. John Benjamins Publishing. pp. 67–95. Evans, Nicholas, Francesca Merlan & Maggie Tukumba. 2004. A first dictionary of Dalabon (Ngalkbon). Maningrida: Bawinanga Aboriginal Corporation. Pp. xxxviii + 489. Mimal Land Management. Mimal Land Management is focused on bringing benefits to country and culture for the Dalabon, Rembarrnga and Mayili landowners and people in south central Arnhem Land. Ponsonnet, Maïa. 2014. The Language of Emotions: The case of Dalabon (Australia). 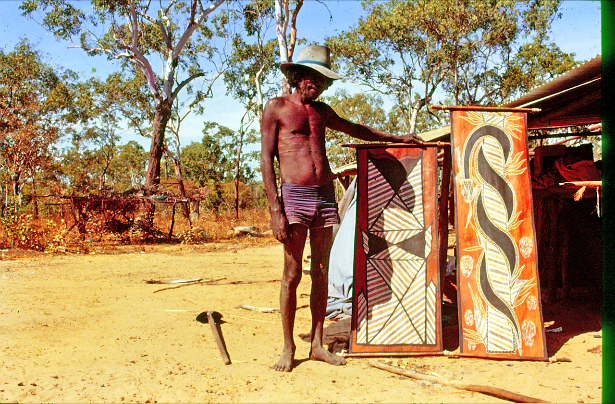 The late David Karlbuma (also spelled Kalbuma) was an artist belonging to the Barabba clan and the Kamarrang subsection. His father was the famous artist Wally Mandarrk. David grew up in the region around Yayminji, sleeping in rock shelters with his father and family, gazing up at rock paintings, some painted way back in time, others by his father. 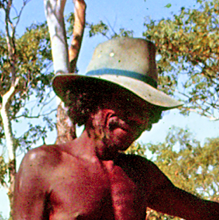 Later he lived at the Korlobidahdah outstation near Maningrida. He spoke the Kune and Dangbon (Dalabon) languages, as well as English. Queenie Bangarn Brennan (born 1951) is a language teacher, language activist and story teller currently living between Barunga, Katherine and Djirrbiyuk near Jabiru. She speaks Mayali as her mother language, Dalabon as her father language, as well as Kriol and English. She has been involved in the documentation of these languages for decades, first as part of the Kriol-English bilingual program in Barunga in the 1980s, later via the Katherine language Centre and collaborations with individual linguists, on Dalabon in particular. She has also co-authored a number of story books in Dalabon and Kriol. The late Maggie Tukumba (original surname Chikappa, skin name Ngarridjdjan) had a vast knowledge of the Dalabon language and over many years contributed an enormous amount to its documentation and recording, through her work on the First Dictionary of Dalabon (1) and the Dalabon plants and animals (2), as well as numerous recordings of traditional stories and other material about Dalabon traditions. She was untiring in her efforts to teach her language to the younger generations, including the many younger children who she cared for for longer or shorter periods. She chose the following words for the preface to the Dalabon dictionary, which sum up her commitment to sharing her knowledge with everyone, whatever their colour or culture: nunh kenbo, kardu marruh-kuno nga-yawoh-yungiyan beba-kah, nunh kahlng-barrakarrminj, warlahmikun bulah-bengkan nunda yang, ba yibungkanh kaye-dja-yu nunh kanh karru-no ‘from now on, whenever I bring out another story or word I’ll put it in the book, so that it can spread everywhere and everyone can use it, and people everywhere can hear and know the language, its real significance’ Then she continued: Kenbo yilah-dulu- burlhkeyhwoyan, mak kaduluwanjingh, bah kadjahlng-ngongno kanh duluno, kanh drebuy njelng yilaye-yenjdjung: Then we’ll bring out the meaning of things, not just one idea, but all sorts of meanings, including the true subtleties of what we say.